This student submission comes from my former student Danielle Pope. Her topic, from Algebra II: solving linear systems of equations with matrices. Based off of the TEKS, matrices are introduced in Algebra 2. In previous math courses, students are already going to learn basic arithmetic from elementary school and solving equations in middle and high school. By the time students get to high school, they should have solving single equations down. This concept is then expanded with a system of equations, which is taught with the help of matrices. A matrix is just an “array of numbers” so that’s why this method of solving can be used with linear equations. Once the matrix is set up there are 2 main ways to solve for the solutions. The one I will be discussing is reduced row echelon form. This method of solving systems utilizes the basic arithmetic that students already know. There are 3 row operations that students already know how to use in general not related to matrices. Those are multiplying a row by a constant, switching two rows, and adding a constant times a row to another row. Even though these specific operations are used for matrices, kids have seen how to multiply 2 constants or variables, switching variables, and adding constants or variables in their previous courses. Matrices just add another element to their basic arithmetic abilities. D4. What are the contributions of various cultures to this topic? Matrices have been around for much longer than some people may realize. One of the earliest civilizations that matrices were traced back to were the Babylonians. This was just one of the many contributions that they contributed to mathematics. The Chinese wrote a book, Nine Chapters of the Mathematical Art, Written during the Han Dynasty in China gave the first known example of matrix methods”. During the same era, around 200 BC, a Chinese mathematician Liu Hui solved linear equations using matrices. In the 1800s, Germany started taking a look at matrices. German mathematician, Carl Jacobi, brought the idea of determinants and matrices into the light. Carl Gauss, another German mathematician, took this idea of determinants and developed it. It wasn’t until Augustin Cauchy, a French mathematician, used and defined the word determinant how was use it today. James Sylvester, an English mathematician, “used the term matrix in 1850”. Sylvester also worked with mathematician Arthur Cayley who “first published an abstract definition of matrix” in his memoir on the Theory of Matrices in 1858. This final definition of a determinant is still used today in classrooms to help solve complex system of equations. In a classroom today, students should be able to access use of a graphing calculator. The matrix feature on these can easily check the work of students just learning how to row-reduce or solve for determinants and inverse matrices. In the classroom, I would use this technology like a race for the right answer to get them engaged in matrices. Give students an easy 2-equation system and have them solve for the variables. Each new problem add an equation or add a variable. While students are solving by hand, the teacher will be using the calculator to see which person can get the answer first. Overtime the problems will be too daunting to do by hand so students will be more engaged to learn this faster shortcut using the calculator. Another resource that can be used out of the classroom is Khan Academies’ videos on solving system of equations with matrices. These videos can be used to fill in any gaps if students have questions at home. These videos can also be used as the lecture in a flipped classroom environment. This student submission again comes from my former student Perla Perez. Her topic, from Algebra: adding, subtracting, and multiplying matrices. Students are to get into four groups (more groups can be added for larger classrooms by making the phrase longer). Students are to add the matrix on each station to the the matrix on the card. When completed students must go change the message on the broad with the code. When the students finish coding the message they can continue developing their skills by having them do this in the beginning of class throughout the lesson plan period. As the lesson progresses the teacher can change the phrase and require different operations to be made to either code or decode or even come up with their own message. With this activity the teacher gets the opportunity to see how the students choose to add the matrices together. In this game the player chooses an operation such as adding, subtracting, multiplying by another matrix or scaler, and its dimensions. When a certain operation is chosen such as multiplication, it only allows the player to choose any size matrix but then spits out one with specific number of rows to multiply it with. The teacher can play this game with their students in any way they sit. The purpose is to get students thinking why and how the operations are working. From there the teacher can introduce the new topic. So many times students don’t understand that what they learn in class is used in everyday life, but teachers can give students the resources and knowledge to see applications of their work. In the video below, it shows different ways matrices can be applied. For instances the operations of matrices are used in a wide variety of way in our culture. The main one can be in computer programming and computer coding, but they are also seen in another places such as dance and architecture. “In contra dancing, the dancers form groups of four (two couples), and these groups of four line up to produce a long, two-person-wide column” and where each square that is created is a formed by two pairs. Like the video had said, matrices can be used to analyze contra dancing. This can be done by having squares and multiplying them creating different types of configurations. By creating different groups and formations, essentially it is using different operations to create different matrices to. “Common Topics Covered in Standard Algebra II Textbooks.” Space Math @ NASA. NASA, n.d. Web. 18 Sept. 2015. Knill, Oliver. “When Was Matrix Multiplication Invented?” When Was Matrix Multiplication Invented? Harvard, 24 July 2014. Web. 18 Sept. 2015. Smoller, Laura. “The History of Matrices.” The History of Matrices. University of Arkansas at Little Rock, Apr. 2001. Web. 18 Sept. 2015. This student submission again comes from my former student Joe Wood. His topic, from Algebra: adding, subtracting, and multiplying matrices. A1. What interesting (i.e., uncontrived) word problems using this topic can your students do now? For a way to engage students who are not interested in astronomy, and to allow students to learn more on their own time of the uses, a homework assignment could be for them to find places other than NASA that this process could be used. “Nine Chapters of the Mathematical Art”, an ancient book that dates between 300 BC and AD 200, gives the first documented use of matrices. Even though matrices were used as early as 300 BC, the term “matrix” was not used until 1850 by James Joseph Sylvester. The term matrix actually comes from a Latin word meaning “womb”. Below is a list published on the Harvard website of important matrix concepts and the years they were introduced. Matrices and matrix operations are used in many math classes from Algebra and Calculus, to Linear Algebra and beyond. So any student interested in studying any discipline of Engineering or mathematics should become very familiar with matrices since they are used in a wide variety of ways (one way is seen above). Matrices are also useful in other courses as well. In Chemistry, matrices can be used for balancing chemical equations. In Physics, matrices can be used to decompose forces. Even in ecology or biology classes, matrices can be crucial. A great example would be studying animal populations under given conditions. One hope in giving so many brief examples is that a student who cares nothing about the topic of matrices would here about a topic they are interested in (say animals) and that would spark questions into how or why matrices are useful. And of course, when dealing with matrices, addition subtraction, and multiplication of matrices follows closely behind. This student submission again comes from my former student Donna House. Her topic, from Algebra: finding the inverse of a matrix. Engage the students by asking them how they think our military (or a secret agent) sends and receives messages without the enemy knowing what message is being sent. Then the discussion can be guided by asking how math is used in encoding and de-coding secret messages. Since they already will have learned about matrices, tell them they are going to learn how to use matrices to create a secret message and de-code a secret message from a classmate. Now have each student pass this encoded message to another student. Each student must use the inverse of matrix to de-code the message! Have them multiply this message matrix by with the inverse on the right. They will get the de-coded Message matrix. From this they can discover the message! We are going to begin with a short video today! So what kind of transformations do you think are used to create computer graphics? The graphics you see in your video games, in the movies, on TV, in flight simulators for training pilots, and in many other applications are all created with the transformations of matrices. Matrix multiplication is used in computer graphics to size and scale objects as well as rotate and translate them. Today we are going to learn to compute a special matrix transformation – the inverse of a matrix! After the students have learned how to calculate the inverse of a 3 x 3 matrix by hand, you could tell them they are now going to calculate the inverse of a 4 x 4 matrix. After they all roll their eyes and groan, you can ask if they would rather do the calculations by hand or on their graphing calculators. Now you can introduce a method for entering the data into a calculator (such as the TI83 or TI84.) Since many graphing calculators can handle large matrices, the matrix and the identity matrix can be entered together as a 4 x 8 matrix. By using the “rref(” application, the inverse matrix will automatically be calculated. Another way to calculate the inverse is to enter the matrix then press the x-1 key. This student submission comes from my former student Alyssa Dalling. Her topic, from Algebra II: finding the area of a square or rectangle. A. What interesting (i.e., uncontrived) word problems using this topic can your students do now? A fun way to engage students on the topic of solving systems of equations using matrices is by using real world problems they can actually understand. 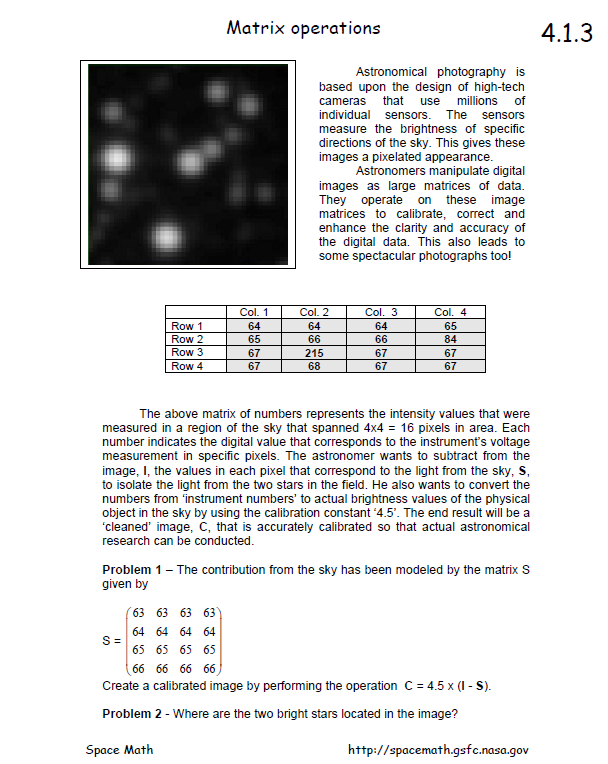 Below are some such problems that students can relate to and understand a purpose in finding the result. The owner of Campbell Florist is assembling flower arrangements for Valentine’s Day. This morning, she assembled one large flower arrangement and found it took her 8 minutes. After lunch, she arranged 2 small arrangements and 15 large arrangements which took 130 minutes. She wants to know how long it takes her to complete each type of arrangement. The Lakers scored a total of 80 points in a basketball game against the Bulls. The Lakers made a total of 37 two-point and three-point baskets. How many two-point shots did the Lakers make? How many three-point shots did the Lakers make? For this topic, creating a fun activity would be one of the best ways to help students learn and explore solving systems of equations using matrices. One way in which this could be done is by creating a fun engaging activity that allows the students to use matrices while completing a fun task. The type of activity I would create would be a sort of “treasure hunt.” Students would have a question they are trying to find the solution for using matrices. They would solve the system of equations and use that solution to count to the letter in the alphabet that corresponds to the number they found. In the end, the solution would create different blocks of letters that the student would have to unscramble. This activity would be used after students have learned the basics of putting a matrix into their calculator to solve. The class would be separated into small groups (>5 or more if possible with 2-3 kids per group) The rules are as follows: a group can work together to set up the equation, but each individual in the group had to come up to the board and write out their groups matrices and solution. The teacher would hand out a paper of 8-12 problems and tell the students they can begin. The first group to finish all the problems correctly on the board wins. There would be problems ranging from 2 variables to 4. The technology of calculators allows this to be a fun and fast paced game. It will allow students to understand how to use their calculator better while allowing them to have fun while learning. where . I’ll refer to the MathWorld and Wikipedia pages for more information. This student submission again comes from my former student Caitlin Kirk. Her topic: computing the determinant of a matrix. Students learn early in their mathematical careers how to calculate the area of simple polygons such as triangles and parallelograms. They learn by memorizing formulas and plugging given values into the formulas. Matrices, and more specifically the determinant of a matrix, can be used to do the same thing. For example, consider a triangle with vertices , , and . The traditional method for finding the area of this circle would be to use the distance formula to find the length of each side and the height before plugging and chugging with the formula . 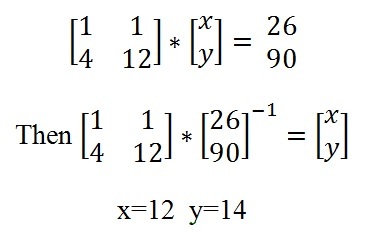 Matrices can be used to compute the same area in fewer steps using the fact that the area of a triangle the absolute value of one-half times the determinant of a matrix containing the vertices of the triangle as shown below. Obviously, the area of a triangle cannot be negative. Therefore it is necessary to take the absolute value of the final answer. In this case , making the area positive eight instead of negative eight. The same idea can be applied to extend students knowledge of the area of other polygons such as a parallelogram, rectangle, or square. Determinants of matrices are a great extension of the basic mathematical concept of area that students will have learned in previous courses. D. History: What are the contributions of various cultures to this topic? There are two fields whose total area is eighteen hundred square yards. One produces grain at the rate of two-thirds of a bushel per square yard while the other produces grain at the rate of on-half a bushel per square yard. If the total yield is eleven hundred bushels, what is the size of each field? While the Babylonians at this time did not actually set up matrices or calculate any determinants, they laid the framework for later cultures to do so by creating systems of linear equations. They then used what we know as Gaussian elimination and back substitution to solve the system by performing operations on the columns until all but the bottom row contains only zeros and ones. Gaussian elimination with back substitution did not become a well known method until the early 19th century, however. Next, in 1683, the Japanese and Europeans simultaneously saw the discovery and use of a determinant, though the Japanese published it first. Seki, in Japan, wrote Method of Solving the Dissimulated Problems which contains tables written in the same manner as the Chinese counting board. Without having a word to correspond to his calculations, Seki calculated the determinant and introduced a general method for calculating it based on examples. Using his methods, Seki was able to find the determinants of 2×2, 3×3, 4×4, and 5×5 matrices. This is the exact condition under which the matrix representing the system has a determinant of zero. Leibniz was the first to apply the determinant to finding a solution to a linear system. Later, other European mathematicians such as Cramer, Bezout, Vandermond, and Maclaurin, refined the use of determinants and published rules for how and when to use them. B. Curriculum: How can this topic be used in you students’ future courses in mathematics or science? Calculating the determinant is used in many lessons in future mathematics courses, mainly in algebra II and pre-calculus. The determinant is the basis for Cramer’s rule that allows a student to solve a system of linear equations. This leads to other methods of solving linear systems using matrices such as Gaussian elimination and back substitution. It can also be used in determining the invertibility of matrices. A matrix whose determinant is zero does not have an inverse. Invertibility of matrices determines what other properties of matrix theory a given matrix will follow. If students were to continue pursuing math after high school, understanding determinants is essential to linear algebra.